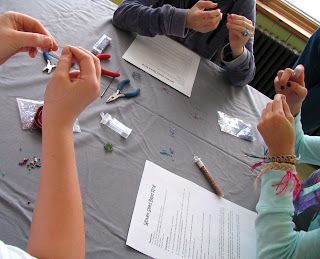 Nelkin Designs Blog: My beading Saturday with 4-H! Our group has a wide range of ages in it. 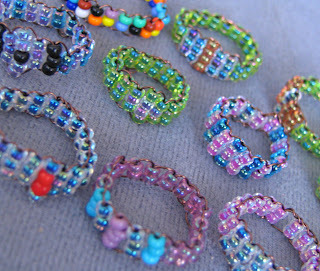 I taught the older kids (8+) how to make Woven Seed Bead Rings, and the younger ones how to make these super cool lizards. The basic technique is the same, so some of the younger ones started out making lizards and quickly moved up to be able to make the rings. 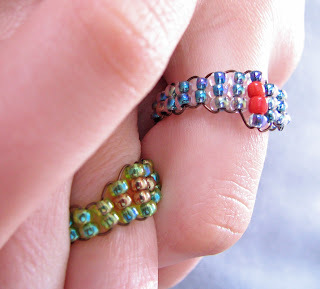 I'll be posting a tutorial showing you how to make these rings. The materials you need are quite minimal, and the results are superb. 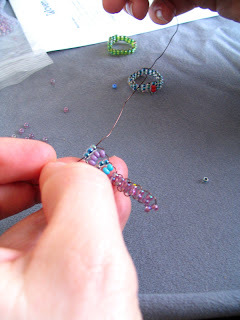 Some of the kids even discussed making bracelets with the same technique... we didn't have enough wire on Saturday, but I am rather looking forward to trying this one day soon. Our group is well on it's way to amassing a good amount of handcrafted goodies to sale later this spring, I can't wait to see what else they come up with... I am SO proud of them! What did you do this weekend? great ! kids love this things to do ! Initial Rings for Women i'd like your blog! excellent! thanks sharing wonderful rings with us.